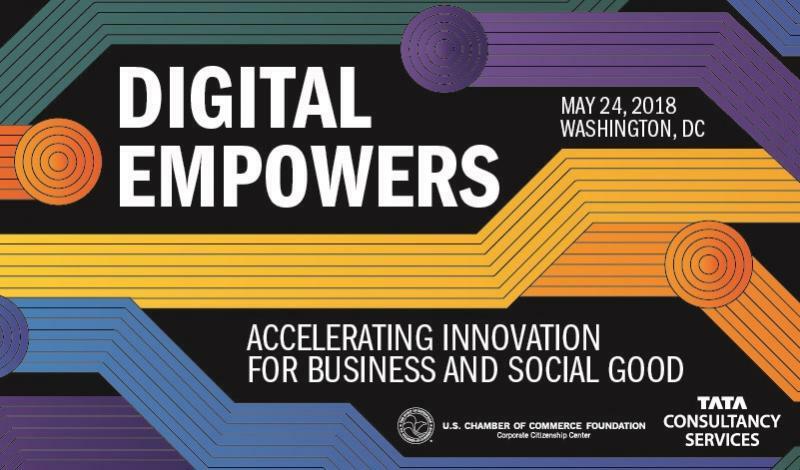 WASHINGTON, D.C. and MUMBAI, May 24, 2018 /3BL Media/ -- Tata Consultancy Services (TCS), (BSE: 532540, NSE: TCS) a leading global IT services, consulting and business solutions organization, in partnership with the U.S. Chamber of Commerce Foundation (USCCF), is convening today for Digital Empowers: Accelerating Innovation for Business and Social Good at the Chamber of Commerce in Washington D.C. The forum connects leaders across business, technology, government, policy, and citizenship areas with on-the-ground partners who are shaping the future of innovation and social impact to discuss with nonprofit leaders how technology can solve pressing societal challenges. Every day, non-profit organizations across the U.S. receive billions in contributions, supporting causes from education, health and the environment, to social wellbeing and arts and humanities. These organizations face challenges, including governance, reporting, impact, and scale. Similar to how digital technology is helping enterprises grow and transform, it can play a pivotal role in alleviating these societal issues and provide an opportunity for social innovation. The forum’s objective is to increase awareness and understanding around the impact of advancements in technology. Speakers from across industries will share how their organizations leverage new technology and digital innovations, including blockchain, design thinking, virtual reality, robotics, and cloud analytics to increase access and equity to individuals and communities. The event’s program will discuss ways to develop partnerships, funding opportunities and human and technology capital. Featured speakers include Surya Kant, President of North America, UK and Europe at Tata Consultancy Services; Kevin Brault, Principal and Federal Health Care Sector Leader at Deloitte & Touche LLP; Dr. Kingsley Fregne, Group Leader of Robotics & Intelligent systems, Advanced Technology Laboratories at Lockheed Martin; Denise Spell, Chief of Operations and Engineering at the Field Innovation Team; and Jeff Weld, Ph.D., Senior Policy Advisor and Assistant Director for STEM Education at the White House Office of Science and Technology Policy. TCS and USCCF will also publish a report defining the strategies organizations can utilize to benefit from advanced technology.